Art as Usual: From One Holiday to the Next!!! Like all of you we had an extremely busy holiday weekend. Friday was Cookie Baking Day at my aunt's, and Saturday morning my mom informed us all that it was Decorating Day. So while Jasper and my mother were scouring the storage area for Christmas decorations I got the upstairs holiday ready. 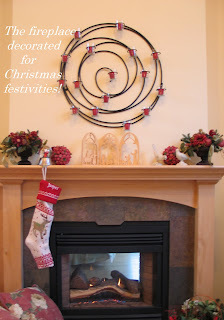 I hung garlands and wreaths and then switched over the fireplace area. This is a focal point in many people's homes. Especially at Christmas! I thought the contrast in colors and decor was interesting so I snapped a few photos to share with you. You'll notice that the basic composition is similar. Two larger arrangements bookmarking a central area. The other difference is the candles. It's a small detail to change them but it really helps to pull the primary accent color up the wall. Creating a larger visual impression overall. 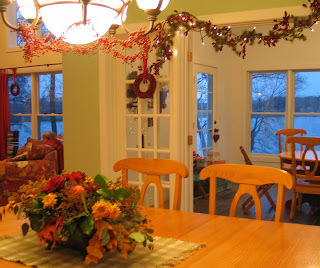 The deep red is repeated in the berry wreaths hung in front of the windows as well as the stairway garlands. My parents have been adding to their Christmas decor each year for years. 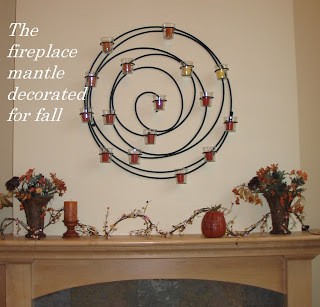 It makes putting the decorations in place simple. I already know what they have and where it goes. 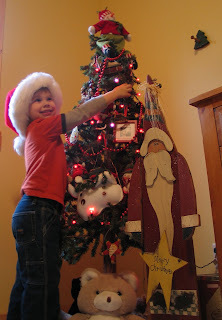 Which is why I was able to decorate the entire upstairs while Jasper and my Mom did the tree in his bedroom. But in their defense, Jasper did manage to cram on that little tree the entire assortment of ornaments usually left for the 10 foot tree upstairs. As you can see in the photo I snapped, he is very very proud of his tree! Enjoy the holidays!!! Love the proud photo of your son! Thank you for sharing this scene with us! I love hearing about others family experiences. Hopefully when Jasper is 10 he'll still be as interested as he is now. One can hope right?